Nursery rhymes are important. Participating in rhyming activities like nursery rhymes stimulates the area of the brain responsible for articulating spoken language. Reading experts believe in the power of nursery rhymes. Mem Fox says in her book, Reading Magic, "Children who know 8 nursery rhymes by heart by age 4 will be among the best readers by the time they are 8." 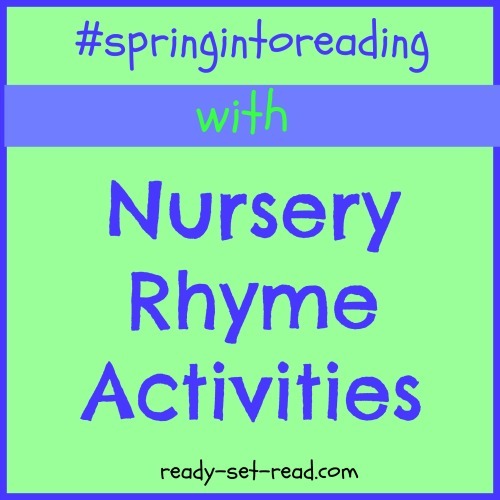 Nursery Rhymes build brain power! I'd love if you'd come back on Wednesday, March 20th to read the series. Also on Wednesday, March 20th, I'll be talking live with +Rebekah P from +The Golden Gleam and +Jennifer Fischer from The Good Long Road about Playful Storytelling. We'll be chatting at 7:30 pm CDT. You can watch it live right here at Ready-Set-Read.com If we aren't connected on G+ yet, I'd love if you'd add me to your circles and I'll circle you back! If you miss the live event, you can always view the event on here as it will be posted to youtube. (Update: check out our playful storytelling hangout below. There are some great ideas of how to do storytelling and involve play. You can use things you already have lying around the house). Our event is part of an entire series of bloggers chatting about literacy for #springintoreading. You can view the event list on Inspiration Laboratories you can also view all of the previous hangouts on a variety of literacy topics. Great ideas. I'm looking forward to trying a couple of them with my three-year-old and four-year-old. Thanks Christy! I hope they enjoy them! What fun ideas. My 2 year-old loves Humpty Dumpty. In fact, that was his birthday cake this year. He'll love making your Humpty Dumpty today! Thanks for the ideas.